I have been so tired in the most recent weeks. Going back to work has taken its toll on me. My wife and kids have felt it as well. Starting school and keeping up with all the different jobs has been exhausting. I barely have time to function. I came across a meme that help summarize how I have been feeling. 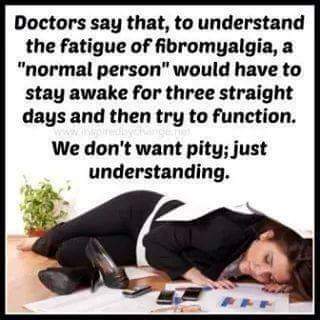 I do feel that fibromyalgia could be changed to almost any chronic disease. I would be very presumptuous to think we have the corner on pain. I am pressing forward. I am doing my best not to let this hold me back. Any prayers would be most appreciated. I find the title funny because I am now employed! I am back in the labor force and am going to be stocking shelves overnight at a big box store. My family is in need of a little extra income to make it through the month and pay some bills off. 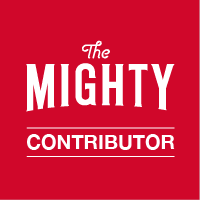 I really wanted to be able to make my blog work on donations or my convention work to pick up the slack but that is not the case. I hope everyone remembers to treat others as humans this weekend and not like robots. I do believe in good karma and treating our fellow man as a person and not a cog in a corporate machine. As you encounter people working this holiday weekend, go out of your way to say thank you. Make them feel special. You could help save a life. 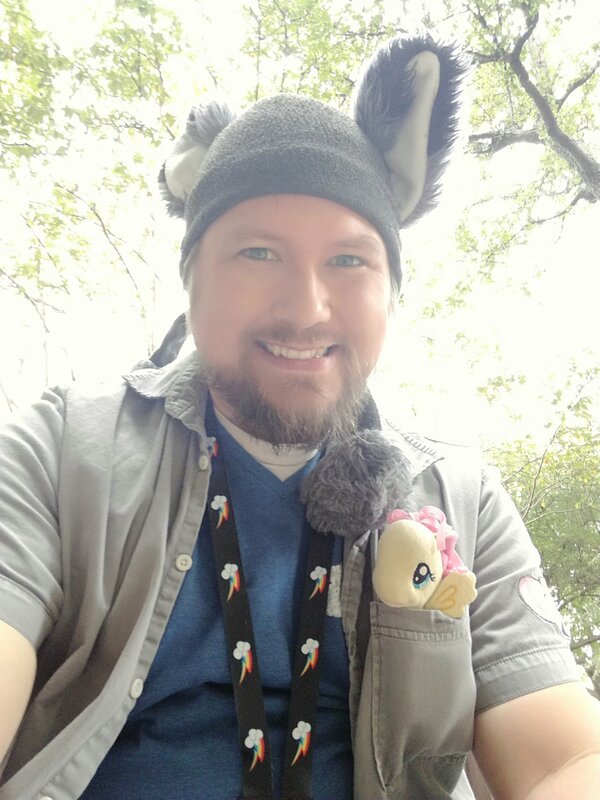 I had a solo panel at Anime Overload in Austin, Texas this past weekend. I managed to speak clearly, not break down crying, and I hope I change some lives. It might not show it here, but it was an almost full panel with most of the chairs filled (including my thumb at the bottom right corner of the screen!). One of the things I do at this type of panel is close the door and make it a safe room. We keep what happens behind those doors safe and secure. Stories that are shared and experiences that happen are locked for only those in the room to hear. I enjoy the help it brings to others. I have been asked to continue this type of panel for at least two other shows. It shows the growing need to talk openly about things like depression and other mental illnesses and give support to those who need it. I have been blessed to have people support me on this adventure and I am humbled to have been put in this position. One thing I notice in this panel is the raw emotion that comes from the room. Being able to handle that and to deal with it has never been easy. I spent the first hour after this panel trying to keep to myself and deal with all the emotional energy that comes from talking/venting/sharing. I have yet to see a panel where at least 50% of the attendees did not cry (myself included). Now this is not just a panel about openly talking about our lives but also how to help others and ways to deal with problems. I always invite people to share their lives and experiences with others to show what works and doesn’t work. I share my life and ways to help others. I push them to form a community of individuals to bond together and to build support groups. At the end of the day I was able to talk to several people closely and give them some guidance in their lives. I was approached by the directors toward the end of the convention because someone (or more than one I am not sure) spoke out at a meeting requesting me to continue to do the panel. Again, humbled was just the first thing I felt. I am drained at the moment but happy. I enjoy helping people and it makes me want to do more. It takes a lot out of me to speak like this but I hope to get better at it. If you were at the panel and want to leave a comment OR you would like to request a panel for a convention, leave a comment. Leave a comment to just say hey if you want, I will respond. It has not been a good day/week/month/year mentally. I have undergone many a issue. I have worked harder on finding out more about myself and what is going on. I have worked harder on myself and my illness. I have tried to make things change. I have pushed to have more control over my life. And I feel back behind square one. I am tired of being tired. I am tired of being sick. I am tired of hurting every single day. I am tired of being a mess. I decided to write what I feel and what goes through my head when I am having a bad day. I wanted to show what goes through my head and what my mind is telling me. I wanted to see on paper and hold my issues in my hand. Try and see the tangible evidence of my mind spiraling out of control. I only wrote for about a minute, but it was not pretty. I AM SELF-CENTERED. I am an idiot. I am a horrid person. I am a failure. I bring everyone down around me. No one wants me. No one actually cares for me. No one wants to give me anything. No one wants to do something for me without wanting something in return. I always feel guilty, even when sitting and reading. I don’t take care of the kids. I don’t fulfill anyone’s hopes, dreams, desires. I am not attractive. I am trying to sort through just went through my head what my mind tells me. My mind is a battleground. I wanted share this with everyone. Not for pity or help. But to show that I suffer as well. I fight each day. I have people fighting with me. I am seeking new ideas and ways to help/sort/better myself. You are not alone, dear reader. Even holding the card in my hand, I see myself and almost want to take pity on me. I have to write things down to get them out of my head? Worthless. Even now I struggle to be free of my mind. Even now I hug a pony. Depression, anxiety, and other mental illnesses don’t carry that same weight. People don’t understand and cannot see the changes. Family, friends, and even doctors all look at you and say “It is all in your head”. While they are not false, this makes it seem like I have the ability to change my illness and “Just feel and act better and you will BE better”. It is easy to forget that these illnesses can be just as deadly. Here are some statistics on depression/suicide. With all this data, why is there such a stigma around mental and neurological disorders? Why are people so quick to judge? Why is it so hard to believe it IS all in my head due to my head having an illness. It is frustrating trying to explain why you can’t focus on the happy. Your mind looks and seeks the flaws. You go and find thinks to fill the gaps in your day so the anxiety doesn’t catch up to you. You just try to stay ahead of the wave that is threatening to drown you. And people stare at you. They wonder why you are so different. They wonder why you can’t just feel better. They just want you to be normal. They are tired of you and all the baggage that you carry. They get tired of you and how you act. Believe me, if I could just “Man up” and be a better person, I would have done it years ago. No, I would never want or wish on anyone cancer. It is a terrible disease and I am glad so much time and research goes into it. I just want people to understand that mental health issues can be just as dangerous and deadly. Keeping people’s mental state in order so they can live better lives should be a focus for everyone. I am calling for prayers and good will to those of us here in Dallas. This was 15 min away from were I live. This is way too close to home for me. I will resume normal posts at a later date. I and my family and friends are fine. I pray for peace for the families of the fallen. Thank you to those who serve.